Land ownership in Zimbabwe has long been a point of contention between the Zimbabwean and UK governments. This is the point of focus in Nyaradzo Mtizira, historically inspired, factual novel, The Chimurenga Protocol. Mtizira sets out to make a case for the present day land redistribution by outlining the injustice to indigenous Zimbabweans, whose ancestors were forcefully evicted from their lands under British Colonial rule. Chirumenga, a Shona word for ‘revolutionary struggle’ and in this case, the struggle of Zimbabwean freedom fighters against British rule/white settlers, hell bent on taking over their land without second thought. From the First, Second and Third Chirumengas to the present day dispute over land in the history of Zimbabwe; Mtizira takes us on a journey in this four part story. He starts in the 1800s and lays the foundation of the first Chirumenga, where he paints the picture of the resilient and persistent force of the local people, who refuse to give up that which is rightfully theirs without a fight. A bloody engagement on both sides, Mtizira depicts William Mason, the Queens representative in Rhodesia at the time as a sadistic, racist and condescending man on a mission to rid the indigenous people of all dignity. “In my experience, I have never engaged a dedicated fighting force similar to these men. They are deeply committed to halting the expansion of the Queens’s Empire. Our presumption has been that because they are Africans and illiterate, they will succumb to our will as the white superior race. After all, we have brought the influence of civilisation and culture to this Dark Continent. They owe us a debt of gratitude.” Mason tells one if his officials. Leap forward to present day Zimbabwe, the story has not changed, the case for land ownership is still a controversial topic as demonstrated by the character of Hamandishe chamunorwa, who is caught-up between the British and Zimbabwean establishments. Armed with a secret file that could benefit the British, his action is seen as treachery and the race to catch up with him before he hands it over starts. 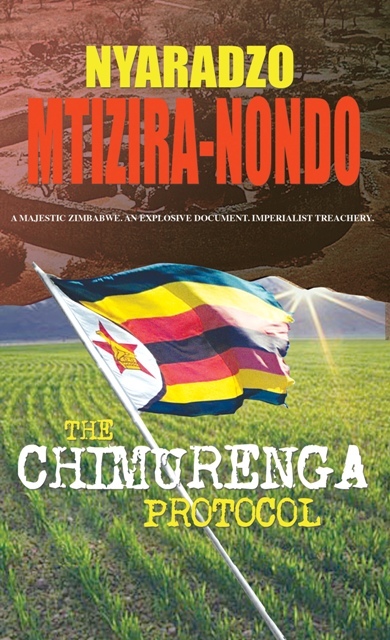 The Chimurenga Protocol is described as ‘a searing indictment of “colonialism and its dark practitioners,” and Mtizira’s offering is a thought-provoking exposition on the issues of colonial occupation of Zimbabwe and the African continent, with its imperialist agenda. But his praise and staunch support of Zimbabwe’s current leadership and approach to land reform by describing it as a ‘visionary leadership’ is questionable. Nonetheless, a worthy read for anyone interested in the explosive subject matter and the deep affinity to land ownership and why it is treasured by Africans. This entry was posted on Friday, April 8th, 2011 at 4:51 am	and is filed under Africa, Book Reviews, Journalism. You can follow any responses to this entry through the RSS 2.0 feed. You can leave a response, or trackback from your own site. What was the main objective of the imperialists or settlers.was it wealth searching or only punishment? Clarify your presentation of chamunorwa and magura,and what was their main significance to the novel.